RM Auctions' consignment team has done another 'bang-up' job from a Porsche perspective. Five of the most exciting Porsche lots in recent memory will be crossing the block in Monaco next month. Dr. Ernst Fuhrmann's twin-cam engine has to be among the most convoluted, frighteningly complicated, and absolutely sublime engineering feats of Porsche's entire history in that period. Built primarily for racing efforts in the early 1950s, the high-rev 'Typ 547' was later slotted into 356 street cars, among other things. Both of the Porsches featured here, one tin-roof and one open-top, were built with this engine installed in the back. While both Porsches are equipped with similar engines, they could not be more different in presentation. Everyone reading this is sure to form an opinion, so which would you rather have? Starting with the Speedster, we see an elegantly proportioned low and lithe minimalist drop-top. This Porsche retains its original matching-numbers Type 547/1 engine, which is rare. Being complex and difficult (i.e. expensive) to rebuild, many of these cars had their four-cam engines replaced with simple push rod engines if any issues were run into. This early 356 Carrera Speedster also claims some unusual specifications that bridge the GS and GT variants. According to the Kardex warranty card, this 356 A was originally distributed to the United States for retail by Max Hoffman’s renowned dealership in New York in August 1956. Records of Karrosserie Reutter’s indicate that chassis number 82189 was originally finished in white paint and fitted with a black top and matching interior trim. Although this car was officially marked as a Carrera GS by the factory, it possesses some features of the GT variant introduced in 1957, that are believed to be original to the car. According to one Speedster expert, this Carrera was equipped by the factory with an upgraded engine, headlight grilles, and a 550 Spyder-style wing mirror, and it was appointed without a heater, making it one of a handful of early GS examples with features of the forthcoming GT trim package. Not much is known between the late 1950s and the early nineties, but the car resurfaced in 1992, when it was re-imported to Germany and acquired a year later by collector Hans Reuter, who commissioned a restoration that prepared the car for enjoyable touring. In addition to rebuilding the legendary Carrera engine to Spyder performance specifications, the restoration inlcuded several tasteful upgrades, such as the addition of Koni Classic adjustable dampers, a 356 B Super 90-specification camber compensator for the rear suspension, a 12-volt electrical system, an upgraded ignition system, Argus steel-braided oil lines, and new Michelin XAS tires. The Porsche was also equipped with an original set of Rudge wheels, which are rare items that alone are quite valuable. The opportunity was additionally taken to add a couple of GT specification cues, including the retro-fitting of a louvered engine lid and the addition of a stainless steel, Sebring-style single outlet exhaust. Post restoration, the Porsche was quite handsomely presented, though it had been painted red at the time. This Carrera Speedster has recently been the subject of a bare metal repaint in its original white finish, and it has also been re-trimmed with a new red interior. The Speedster is currently equipped with Cibie spot lamps, window side-screens, a correct tool kit, a tonneau, and a proper Rudge wheel wrench. With minute attention to detail, this Porsche should garner favor among the judges at any Concours event in the world. Along with its visual appeal, the Porsche can be equally enjoyed for its high-revving performance, with heart-racing glimpses of the special flat-four’s dual-cam power. This Porsche is estimated to sell between 780,000 and 900,000 euros. Where the Speedster featured above does its level best to keep a subdued exterior appearance, only making its secrets aware to those 'in the know', this Coupe makes its inward sporting intentions abundantly apparent. This warm and lovely Porsche Carrera 1500 GT Coupé was recently acquired from an Italian collection. The first 356 A Carreras, introduced in 1955 in the GS (Grand Sport) and the competition-oriented GT (Grand Touring) form, developed 100 reliable horsepower from just 1,498 cubic centimeters. With a dry weight of just 820 kilograms, these ferocious little coupés enjoyed a true 200 km/h capability, which was quite amazing for the day. These four-cam, dry-sump engines also enjoyed steady development in the racing department, with the largest variant producing upwards of 180 horsepower by the time production ended in 1965. When properly tuned and driven, Carreras were all but unbreakable and unbeatable. The 1500 GS Coupé offered here was delivered from the factory to a Herr Grenz in February of 1957. At the time, it was originally fitted with engine number 90758 and transmission number 12442. Factory options on the car included a Becker radio and antenna, a pair of fog lamps, an anti-glare interior mirror, and a set of color-matched 'coco' floor mats. The Porsche was painted Sahara beige, and the interior was done up in red leatherette. Hand-written entries on the Kardex notes that the car changed hands in December, 1957 with Wolf Diether Mekler, of Wallekirch, Germany, listed as the new owner. Also indicated, the engine was replaced just a few days after the sale. The provided history of the car states that the Carrera was owned by a young German gentleman in the early 1980s, the scion of a metal box manufacturer. By the late 1980s, the car was acquired by an Italian, Paolo Morigi, residing in Switzerland. Sr. Morigi delivered the car to marque expert Tiziano Serratini in Bologna, Italy, for a complete restoration. As Sr. Morigi considered himself quite the “gentleman driver”, the car was then equipped with a roll cage. A proper FIA Historic Technical Passport (HTP) was obtained as well, allowing him to participate in international vintage rallies. The car was re-trimmed at Autorlando-Sport, a well-known Porsche service and racing preparation centre in Pedrengo, Italy. The replacement engine, a correct 1958 Carrera 1500 GT, was rebuilt by Swiss four-cam expert Armin Baumann and has clocked fewer than 1,700 kilometers since. The current owner purchased this Porshce in the summer of 2013, describing it as being in very good condition and having a very straight body, good paint, and proper gaps all around. The consignor had the interior reupholstered by Tappezzeria Cassina e Milesi S&C, a Porsche 356 specialist shop in Padrengo, Italy, in the car’s original color combination, with correct oatmeal square-weave carpeting. It is now fitted with speedster seats, but the original GT Coupe seats are also included. The is currently set up for vintage rallies and touring and is fitted with a rear tow hook, period-correct leather in the front and rear bonnet and engine cover straps, Perspex side and rear windows, and black rubber floor mats. The original Becker radio and antenna were removed by the previous owner, and the dashboard’s radio mounting area is now covered by a correct factory blanking plate. An additional oil pressure warning lamp has been mounted on the glove box door. It is supplied with a spare steel wheel and tyre, a partial tool kit, and a copy of the factory Kardex. Only 787 GS/GT Coupés were built by Reutter for the 1957 model year, making this beautiful Carrera a worthy addition to any serious collection. This Carrera Coupe is estimated to sell between 420,000 and 520,000 euros. Of the two, I think I'd prefer to have the coupe in my garage. It has just a splash of patina in all the right places (horn cover), has the right "Porsche Sports Purposes" look to it, and gives off a bit of an irresponsible boy-racer vibe that I can appreciate. 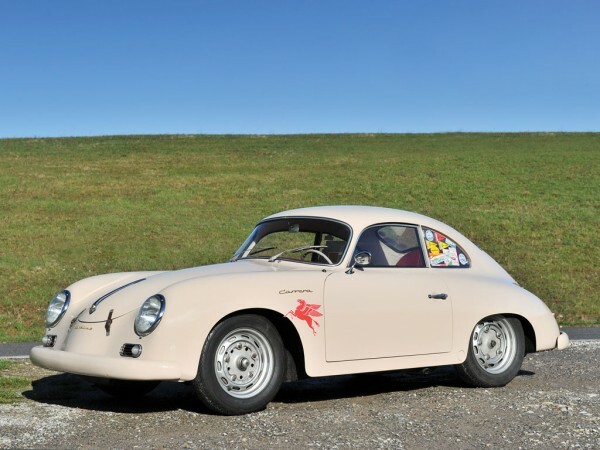 The current interests in Porsche 356′ makes me happy that I have held on to mine for well over 40 years.